Designing your own DVDs is a great option, specially when dealing with customized contents. Adding menus with different themes and textures, chapters, show video transitions, add selection buttons, apply effects, create playlists... Everything is possible with DVD-lab. 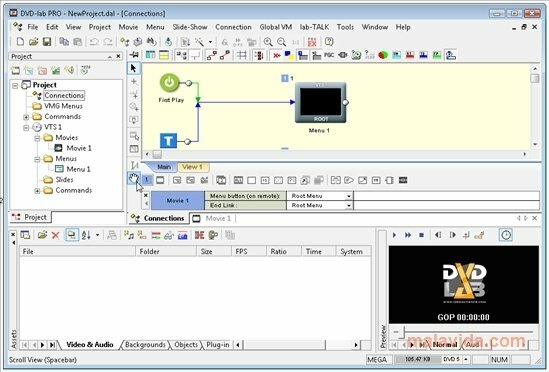 DVD-lab includes Multiple-VTS support, something that implies being able to use different ratios and films with different audio channels on a single DVD without any need to use a pre-established structure. It has been specially developed for professional studios, but if you're interested enough you will easily be able to learn how to handle it due to its simple interface and ease of use. Each title that you create can encompass eight audio and eight subtitles channels of those that are most common among users. Start off in the world of DVD designing with DVD-lab. Edit the whole structure thanks to its complete functions and enjoy its contents very comfortably.